FHA mortgages account for nearly 1-in-4 closed mortgages nationwide. Getting approved for one, though, is tougher for borrowers “on the margin” than it once was. The Federal Housing Administration (FHA) changed its mortgage guidelines, affecting how lenders underwrite and approve FHA-insured loans. The FHA tightened its income verification for self-employed and part-time workers; and changed the ways it treats certain debts, including student loans and credit card balances. The agency also upped its documentation requirements for gift funds used to purchase a home. The changes render FHA loans more difficult for which to qualify, but certainly not impossible (or even improbable). FHA mortgage loans remain among the simplest mortgage loans for which to qualify based on their forgiving qualification standards. Rates are low with FHA mortgage loans, too. Since mid-2014, FHA mortgage rates have averaged close to 15 basis points (0.15%) less than rates for a comparable conventional loan via Fannie Mae or Freddie Mac; and, for borrowers with average or below-average credit, FHA mortgages can be a long-term win. The Federal Housing Administration is not a mortgage lender. Rather, it is a mortgage insurer — and always has been. Established in 1934 to promote homeownership and neighborhood stability, the FHA provides insurance to mortgage lenders making loans to U.S. homeowners. In order to “get the insurance”, though, lenders must certify that loans being made meet the FHA’s insurable standards. These standards, commonly known as the “FHA mortgage guidelines”, encompass all areas of a home loan approval and establish minimum standards for a borrower’s income, assets, and credit score, as examples; and, for the home’s appraised value. 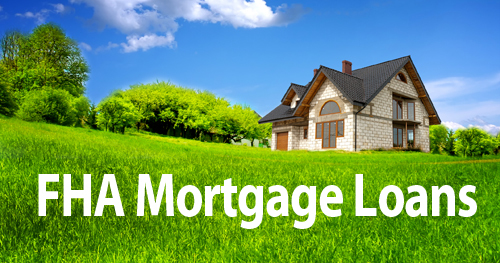 Loans meeting FHA guidelines can be insured by agency and, therefore, approved by a bank. Loans, which fail to meet FHA guidelines, can’t get approved. Among the most well known FHA guidelines are the ones governing down payment on a home. The FHA requires homebuyers to put down just 3.5% on a property. In order to qualify, properties must be designated as your new primary residence, and must not have more than 4 units. Condos and town homes are okay. And, for subsequent refinances of the same home, the FHA will waive the “home equity” portion of this guideline altogether. Even if your home has no equity, it can be refinanced via the FHA Streamline Refinance program, which requires neither a home appraisal, nor a re-verification of income, assets, or credit. If you’ve been paying on time and are current on your loan, you can refinance your FHA loan to lower rates immediately. For today’s homebuyers who plan to use an FHA-insured home loan, mortgage guideline modifications may make it more difficult to get qualified. The majority of updates concern how income is calculated on a mortgage application; and how an underwriter should treat applicant debt. Many FHA borrowers are unaffected by changes. Some though, including buyers with student loans, are affected directly. Now : All loans in deferment apply toward a borrower’s debt-to-income. The corresponding payment is 2% of the outstanding balance, unless a specific payment can be documented. With $25,000 in student loans, then, the FHA assumes a monthly payment of $500. Formerly : “Authorized” users of a credit card had no responsibility to make monthly payments. Payments did not count toward a borrower’s debt-to-income (DTI) ratio. Now : Authorized users of a credit card must include the card’s monthly minimum payment in their DTI unless it can be shown with canceled checks that the last 12 payments have been made by the credit card’s primary owner. Formerly : Installment loans with 10 or fewer payments remaining was not included in a borrower’s DTI. Now : For installment loans with 10 or fewer payments, only the portion of the payment which exceeds 5% of a borrower’s monthly income must be included in the DTI calculation. For example, a $500 car payment against $8,000 of monthly income would require $100 to be used in the DTI (5% of $8,000 = $400). FHA mortgage is a huge part of the mortgage lending landscape, and mortgage rates look great. Borrowers meeting rhe agency’s minimum mortgage guidelines can buy homes with as little as 3.5% down, and in as few as 30 days.